New chassis: 4×2, 6×2, 6×2/4, 6×2*4, 6×4, 8×2/*6, 8×4/4, 8×4*4, 10×4/6, 10×4*6 and 10×6/4. New Plastic and paintable chassis. This RJL Tuning Pack will turn your Scania in a a very large Scania truck. You get several cab’s, engine’s, Transmissions, Multiple chassis. You also get more lights that I can count. You will also find that you get the standard paint as well as the Metallic paint. I also found that I was able to use my custom paint skin on the truck and it looked great. There is so many parts with this truck, I would have to say there are to many to mention. This is an awesome truck, I really think it is one of the better tuning mods that I have tested in a long time. What type scania this mod ? 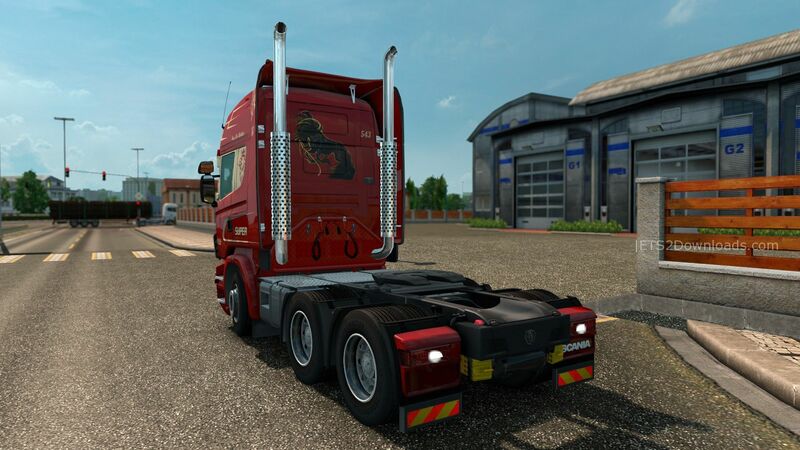 Lukas you will find it in Scania dealer and it will have (RJL) r. This is one of the best mods as far as Scanias I have seen I drive this a lot and love it. it freezes ETS2…. i tried running it with 1.1, without it, without other scania mods… everything freezes once i start the scania store…. Are you using it with other tuning mods? like i said, i disengaged the other mods and it still froze. There is a lot of causes for this problem. Can you try to use it with new profile and give me the game log when it crashes pls? because of the error when changing cabin ???? And to enable the two archives together? Does it work together with the TCab reworked by Henki? i had it once, this mod, and it crashed my game somehow. 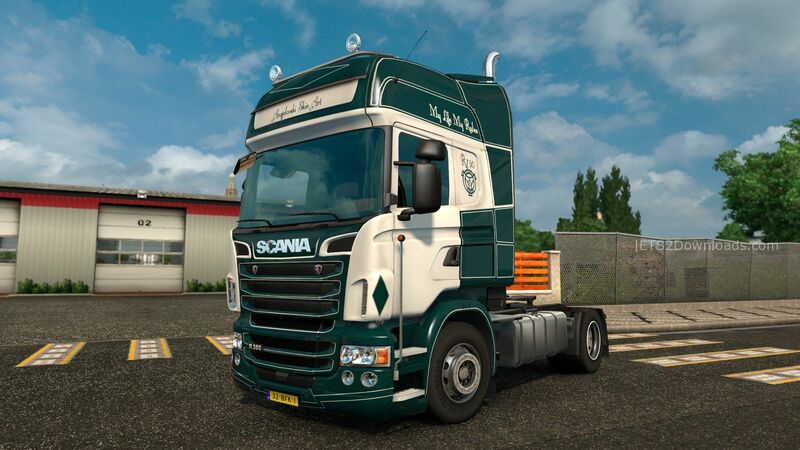 I can use this mod with the original Scania T by RJL. I haven’t tested this truck with 164L yet. Thank you! Does this work with 1.16.2? Nope, I am so sorry, only 1.18. You should also upgrade your game to 1.18, most mods now are just available for 1.18! This mod is great, but the only problem I have is that i Can’t select more lights for my grill. I see other people put like white lights and all sorts of colors on their grills, but I can only choose from: Grill light, Lobar light and the Scania ‘Super’ sign. Does anyone know how i can select more lights? can you help, i have followed the installation guide but this mod is still not working for me, i have this mod plus “military cargo pack by jazzycat” installed only, the cargo pack is working fine but this one isn’t, it may be something silly that i have missed but i can’t find it. any help would be greatfully appreciated. Have you tried to visit the Large Scania Dealer in game? Are you using ETS2 v1.18? I can’t get 1.4 to work with 1.18.1.3. 1.3 works just fine, but for some reason, after updating this mod to 1.4 and attempting to go into a Scania dealership, the game just crashes. I unselected all of my Scania mods and this one still crashes. Is there any tuning mod that works with the V1.4? There is no new tuning mod for this truck. I will try to test the old one with this new version! I saw a few screen with more tuning piece (others lights , neons and colored leds) than availible in this pack. Yep there was an addon pack for this truck, but it doesn’t work anymore after the update v1.17! Anyone else having probs with addon paint packs? I can’t paint with my Scottish paint pack. I can’t get it. This mod contains the truck with all the tuning parts? Or just the tuning parts? Does anyone know if this works with v1.20, or if it doesn’t, if the author is working on a new compatible version? It is working fine with 1.20 buddy! I have installed the mod, and all the items is in “new upgrades” but when i go to equip them I can’t find them. it crashes my game.. does any of you know why? Can you post the log file here buddy? Are you using any other Scania mod? my game is 1.21 i belive, after a view tries i have discovered that is works fine as long i dont change anything to the interior. im not using any other scania mod. mine does too.. but it is such a nice mod..
Can you prove your log file buddy? It’s already working, it wasn’t compatibel with another mod that I used. Great mod by the way! Glad to hear that buddy! Nice! Did you try to find the truck in another Dealer buddy? tried the ones in sweden. but maybe there is a specific one i need to have ?? heyy i puted the mods in the mod folder but doesnt work … btw in the mod selection in game its activated and my version is 1.21 whats the problem? Did you try to visit another dealer buddy? Can you see it in the about~>Trucks page? The mods dosen’t work for me or because my game version? (v1.21.1s). I need this mod so bad. Please help..
I’m using 1.21 and everything is okay. Please go to About ~> Trucks in game to see If it’s there or not. Does this work wirh toys DLC? So there seems to be some confusion on how to find a truck. Basically you can’t edit an existing Scania truck you own. You have to buy a new truck from a Scania dealership, you can do it online or at the dealer, in the list there will be a truck called Scania RJL, buy this truck and have fun! Also want to say, what a great mod, seriously well done! A must have for any Scania lover like myself. I’ve been on the fence about mods since I’m a stock game kind of guy, but I’ve been missing out, this is easily the best truck mod in the game. One request though, can we get some kind of decal position on the ‘forehead’ of the truck? 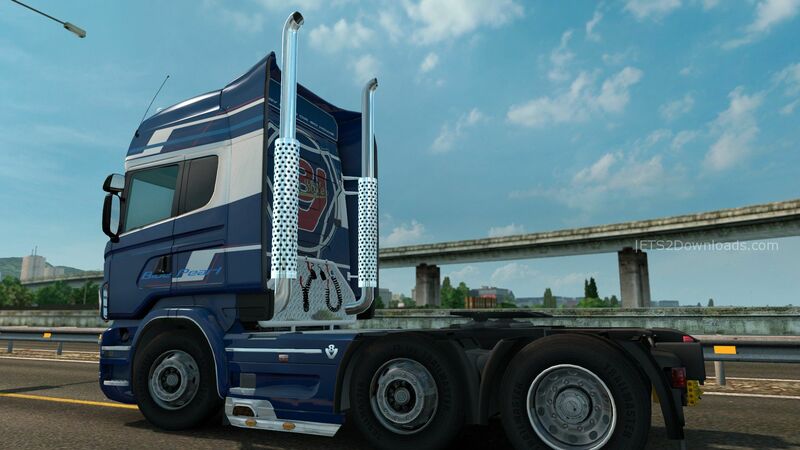 So we can possibly add a Streamline decal or some other kind of Scania decal. Thank you very much for the comments buddy! Are you going to make this 1.22 compatible? The engine brake sound has disappeared and I read that all truck mods have to be updated for it. Does this mod works with the cabin acessoires DLC? Works fine with the Accessories DLC Stjn! Any chance we can get those lights that are a combo of brake light, tail light and turning signal? I tried posting a link to a pic but it wasn’t allowed. If you google stiholt you’ll see what I mean. I really need help,i’m trying the best i can but i just cant get this mod to work SOMONE PLEASE HELP ME! 🙁 It says that i need to move all the .scs file(s), but there are no .scs files there, just normal folders. Please halp me, i need this mod so badly! this is not an scs file, its a bunch of folders inside the rar folder so where do i put it?? ?